Baker Auto Repair offers a Fleet Solutions Program to better serve businesses and organizations in need of fleet repair. 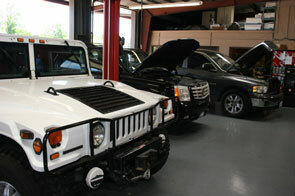 Beaumont area business owners often rely on their fleets to get the job done. We understand that when a vehicle from your fleet is in need of repair, your business is not operating to its full potential. For this reason, our Fleet Solutions Program is designed with your organization’s needs in mind to repair your vehicle and get both you and your business back on the road as soon as possible. At Baker Auto Repair, we provide you with a longer warranty on parts and services, free pickup and delivery service and a no-wait priority service to ensure a quick fleet repair turnaround time. If you require a diesel repair, we are Powerstroke and Duramax certified to provide service for both commercial diesel fleets as well as individual diesel vehicles. Our Fleet Solutions Program offers competitive, fleet-specific pricing and monthly invoicing for your convenience. With Baker Auto Repair, you can trust that your fleet inspections are performed by automotive experts who have you and your organization’s best interest in mind. Call us today to receive a quote for your fleet service needs!